Following Chen’s solo exhibition entitled “Notations of Time” in 2010, his new creations named “Flying with the Wind,” that also belongs to this series, will be exhibited at the 3rd Guanlan International Print Biennial starting on 12th May, 2011. The entity of the “Notation of Time Series–Flying with the Wind” is an 8m×6m×3m large-scale spatial installation. 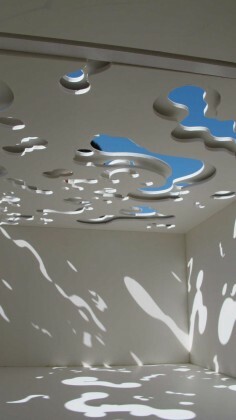 Chen Qi utilizes his unique styling elements—“wormhole” to create a hollow treatment of the roof. Visitors can walk into the space which is like a small house, thus experiencing the visual beauty brought by changes of the light and shadow. Changes due to the time and light make multiple spots move in different directions as if a crystal life is elegantly flowing at that precise moment. The reproduction of “the illusory” and “the real” in the passage of time simulates fresh and sweet music and creates an imaginative space to the viewing public. As a printmaker, Chen Qi explores the emerging possibilities of “version”, “trace” and other concepts in this piece of work with his “light and hollow physical entity” replacing “knife and board”. Talking about the production of his work, Chen Qi mentioned his first visit to Hakka houses when he attended the 1st Guanlan International Print Biennial. He was impressed by the light produced by the hollow tiles on their roofs. Year after year, the sky and the sun continuously shine on this land, though the Hakka people have left their homeland in the comings and goings. This piece of work includes Chen Qi’s thought on the relationship which seems virtual and real, tangible and invisible between “time” and “existence”. Taking into account different observations by the visitors, Chen has a special imaging device projected outside to play the demo of its’ overall effect. Besides, he will continuously record the changes of spot light by using a video recording during the month it is displayed, so all the physical images and space devices will jointly combine in this integrated work..
Chen Qiulin (b. 1975) is an emerging artist who is deeply concerned with the impact of urbanization in China. Her practice includes performance, photography, video, installation and most recently sculpture. She combines personal history with themes of demolition, migration, and transformation to express the reality for “ordinary people” living in China today. Born in Hubei Province, Chen Qiulin graduated from the Printmaking Department at the Sichuan Academy of Fine Arts and currently divides her time between Chengdu and Beijing. Chen Qiulin’s work has been exhibited throughout China and abroad. She is currently preparing for an exhibition at the Hammer Museum in Los Angeles and her work will be included in The 6th Asia Pacific Triennial of Contemporary Art (ATP6), Queensland Art Gallery and Gallery of Modern Art, Brisbane, Australia (2009). Chen Qiulin orchestrates and documents elaborate performances in both post-industrial and natural settings in her native Sichuan Province. Incorporating sculptural elements and relics of traditional life into her photographs and video works, she imparts a dramatic, intuitive take on the rapidly changing Chinese landscape. Chen Qiulin was born in China in 1975 and now lives and works in Chengdu, Sichuan Province. She graduated from the printmaking department of the Sichuan Fine Arts Institute in 2000. Her work has been featured in solo exhibitions at the Hammer Museum, Los Angeles; the Today Art Museum, Beijing; University Art Museum, University of Albany, New York; Big Factory, Shanghai; and Internet Affairs, Chengdu. She has participated in numerous group shows in the United States, Europe, and Asia, including Displacement: The Three Gorges Dam and Contemporary Art at the Smart Museum of Art, University of Chicago; the Seventh Gwangju Biennale; China Power Station Part 2 at the Astrup Fearnley Museum of Modern Art, Oslo; and The Wall: Reshaping Contemporary Chinese Art at the Albright-Knox Gallery and University of Buffalo Art Galleries, Buffalo, New York. Her work is in the collections of Thyssen-Bornemisza Art Contemporary, Vienna; the Denver Art Museum; the Bohen Foundation, New York; the Worcester Art Museum, Worcester, Massachusetts; and the Queensland Art Gallery, Brisbane. In 2007 she was awarded an Asian Cultural Council grant. Chen Qiulin is from small town on the Yangtze river which was submerged by the Three Gorges Dam. Like millions of others she has seen where she grew up disappear forever and has had to adjust to making a new life in another place. She can never see her childhood home again and the future is all new. Whether this ‘new’ is bright and wonderful or lonely and haunting is a question which preoccupies her. Having had part of her own history taken away she investigates the place of tradition and its relationship to the individual in this new China she now inhabits. Her installation of tofu alongside a new road in the lush Sichuan countryside is a work filled with reminders of tradition and of people who populate that tradition. The tofu characters are the one hundred most common Chinese family surnames. This element of the work is packed with significance. First of all, these are names, names of people, families found all over China. Almost everyone will be able to identify with these names. If they do not find their own name among these one hundred they will find the name of their neighbours, their classmates or their friends. The human element, the ordinary human element here is so important. This is about history that affects the ordinary people of every village, town and city. The ordinary, the everyday, the commonly used and widespread is again emphasised by the tofu. It is a basic ingredient of Chinese meals. It would be hard to find a Chinese person who had not tasted tofu or a region that did not have its version of preparing tofu. The countryside in which the characters sit is the lush, intensely green Sichuan countryside. This is what Chen Qiulin knew as a child growing up in a small town/village. This rich vegetation that is luxuriant, abundant and generous. It is comforting, reassuring to see that nature can be so abundant. Across this greenness runs the new road. It is a very new road, black, smooth and fast, leading nowhere that one can define in the image but undoubtedly going there very fast. In a serene image without people, Chen Qiulin has incorporated family, friends, neighbours and all the ordinary people who are being catapulted towards an undefined, brand new future. In Hometown (performance & photographs) Chen Qiulin presents us with the unnerving situation of someone trying to maintain normality among the ruins of a town. In the performance she is dressed in white, like a western bride or someone in mourning, sitting at a dressing table while a man throws butter cakes at her which she doesn’t appear to notice – all this in the middle of the rubble of destruction. The contrast of beauty and devastation as well as the feeling that this person in white is a little deranged is striking. Chen Qiulin says of her generation that they are the ones who grew up eating butter cakes and watching television, that they were not politically engaged like previous generations. This is a work redolent of fragility and pathos. River River is another work examining this new world and is a marvellous combination of elements from reconstructed China. There is the town destroyed and being rebuilt with modern tower blocks that are seen all over the country. There is the ubiquitous doorman of all these new buildings and the water cooler found in every Chinese office and most homes for that matter. The young trendies sit at a different table from the young characters dressed in traditional opera robes. The present and the past separate but still part of the same actuality. A bizarre setting but this is what the truth is. These figures represent elements which make up this new situation, these new towns. Chen Qiulin puts them together but independent in the setting of destruction and reconstruction that has been the source of their actuality as well as the ground of their future. The Chinese love their tofu (also called ‘bean curd’) so much it comes in a variety of textures – from jelly-like wobbly soft and silken (as is used in making hot and soupy yong tou fu or refreshingly cold almond bean curd dessert) to spongy packed semi-dried tou pok (a vital ingredient in spicy laksa and rojak) to air dried bean curd sticks (that are great for steamy chicken, with mushroom, stews and equally hot ginko barley desserts). There is a tofu for every Chinese inspired dish imaginable for the every day and every other occasion, with each region in China having its very own special ways of using this common ingredient. The humble bean curd is as quintessentially Chinese as is the fact from China that 70% of this country’s current population is made up of people having the most common 40 surnames used by this race. The family name ‘Zhang’ alone is held by more than 100 million mainland Chinese. Along with the other 9 top contenders – namely ‘Wang’, ‘Li’, ‘Zhao’, ‘Chen’, ‘Yang’, ‘Wu’, ‘Liu’, ‘Huang’ and ‘Zhuo’ – they belong to 40% of China’s people. It then comes as no major surprise that the 100 most common Chinese surnames may well encompass most of China’s population – except maybe those holding really rare surnames – like ‘Mao’, ‘Jiang’, ‘Bai’, ‘Wen’, Guan’, ‘Liao’, ‘Miao’ and ‘Chi’ for example. These 100 most familiar surnames are essentially as fundamentally Chinese as the commonly eaten tofu. Little wonder then when mainland Chinese artist Chen Qiulin decided to sculpt these very family names into a work of art, she chose as her medium the definitive curd her ethnic group had ingeniously derived from the soya bean centuries ago. And she aptly named the masterpiece “The Hundred Surnames in Tofu”, of which she will exhibit at Art Stage Singapore 2014. This is a logical sequel to an earlier piece, “Bean Curd of 14 February” – a work that combines sculpture, installation, performance, video and photography. In this prequel, Chen also sculpted the 100 most common surnames in China onto tofu, alongside a new road in the lush countryside in Mianyang, Sichuan and the process was recorded. 14 February 2004 was the date she exhibited this artwork, during which party-style over a traditional Sichuan hot pot dinner, the cultural workers, artists and village people attending the party and Chen ate the 100 sculpted tofu; all washed down with an abundant supply of thirst-quenching beer. By so doing, she cleverly tied the notion of the Chinese-ness of these common surnames to the very Chinese act of making the tofu China’s everyday culinary ingredient. What has compelled her to create these artworks? Well, Chen is born, bred and works in Chengdu, which belongs to the Sichuan province in China. And this is one area that has had parts flooded as a result of the 3 Gorges Dam project – which was the building of a hydro-electric dam that spans the Yangtze River in Yichang, Hubei province. This project was religiously pursued by the Chinese government as it can supply 23,000 MW of power for local consumption. It also increases the Yangtze River’s shipping capacity while reducing the country’s carbon footprint by 630,000 tons and the potential floods downstream by providing extra flood storage space. Unfortunately, to create this engineering marvel, the dam also flooded 1,300 archaeological and cultural sites and displaced 1.3 million people. Thus, Chen not only lost her home in Wanzhou City, Sichuan, she also lost a crucial part of her personal and cultural history. So her sculpted tofu installations raise the question on tradition’s role in society and its relationship to the individual person in this new China she now lives in. At the same time, Chen has filled these artworks with endearing reminders of the ordinary people of every village, town and city populating that tradition. Putting the tofu in the lush Sichuan countryside became her way of remembering herself as a child joyfully growing up in a small village rich with abundant lush vegetation. Putting them next to a long new road whose destination is unknown to the traveler being catapulted rapidly along in a gleaming new car also implies that her displaced people have been similarly pushed forward into a brand new but unknown future: a scary thought? By so doing Chen is again living up to her fame of belonging to the younger generation of artists who create work that reflects on the social repercussions of China’s ever-constant push for political and economic reform.